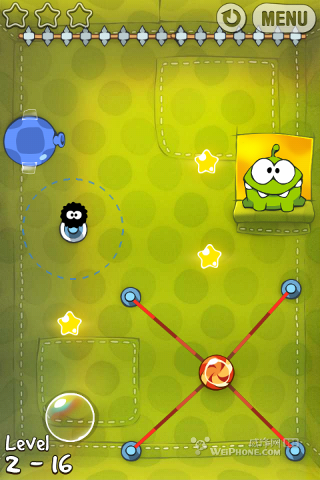 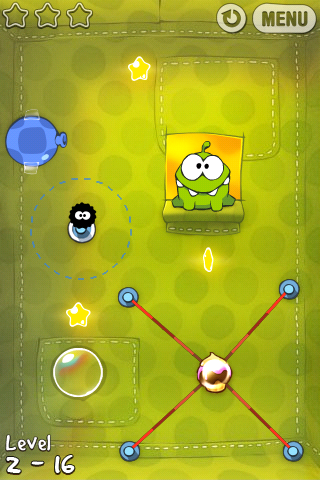 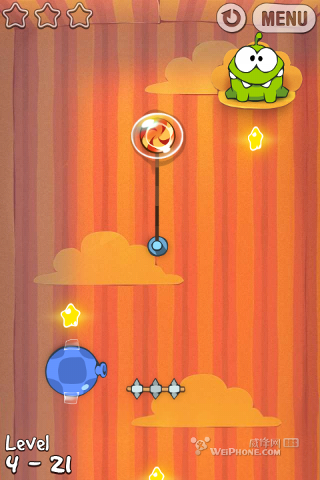 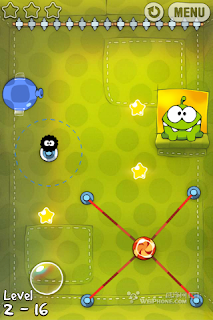 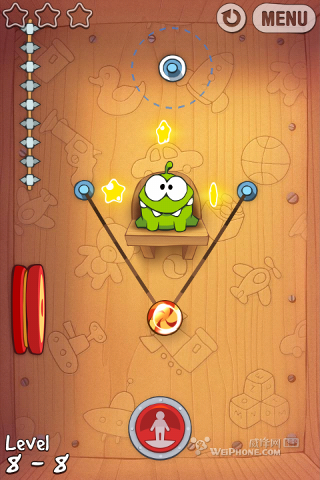 "Cut The Rope" and "Pudding Monsters": Changes to Level Design in "Cut The Rope"
Changes to Level Design in "Cut The Rope"
If you're not a regular player of "Cut The Rope" starting from its early 1.0 or 1.1 versions or if you're not observant enough, you may not know that some of the levels in the game have been changed. 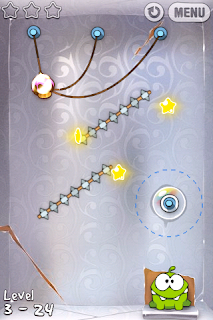 So far they've been changed 3 times, the 1st time in ver. 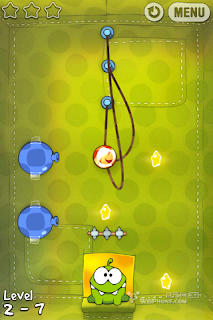 1.2 (when the 6th box "Valentine Box" came out, now changed to 5th box) where they simplified some levels of the "Cosmic Box", the 2nd time in version 1.4 (changes to "Cardboard", "Fabric", "Foil" and "Gift" boxes) and the 3rd time in ver. 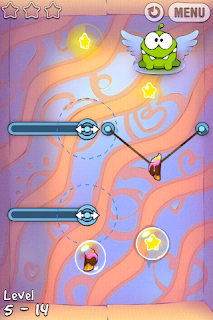 1.6 (changes to "Cosmic", "Valentine", "Magic" and "Toy" boxes). 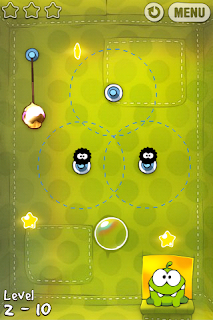 (1) "Cosmic Box" level 6: Added a bubble at bottom right. 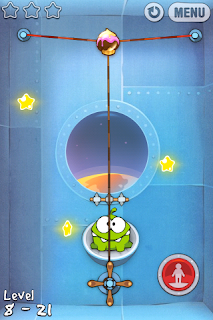 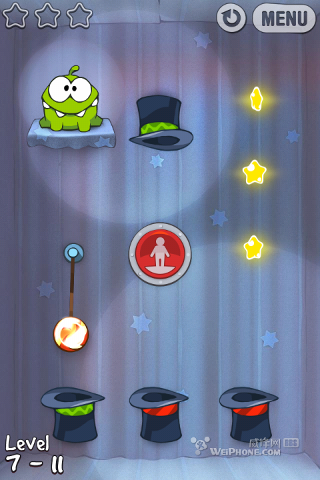 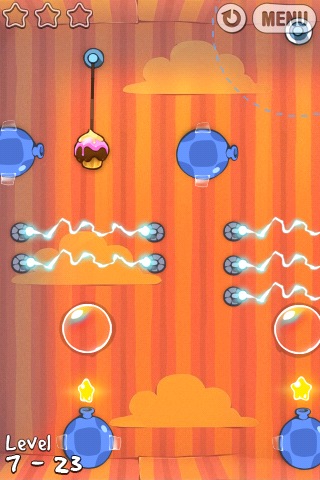 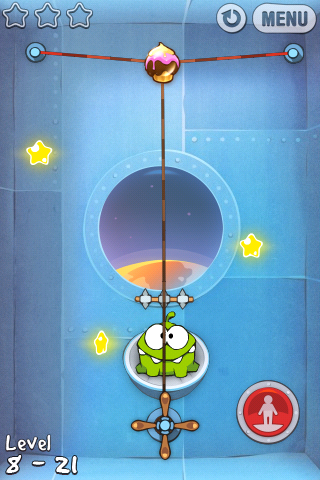 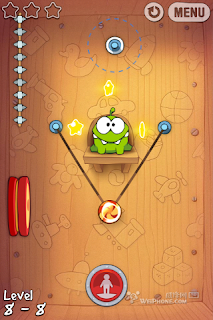 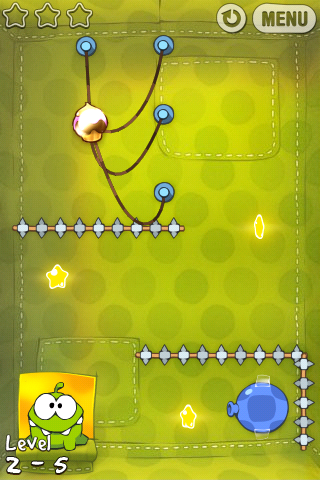 (2) "Cosmic Box" level 10: Removed the upper rope previously attached to candy and shifted the location of the anti-gravity device from top to bottom. 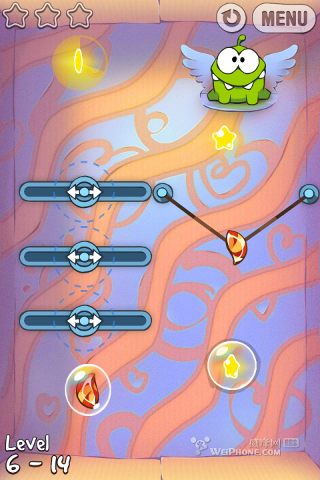 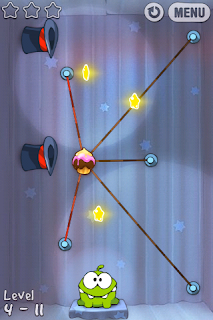 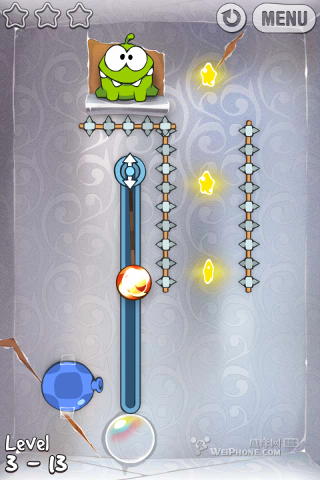 (3) "Cosmic Box" level 14: Removed a row of spikes previously just under Om Nom. 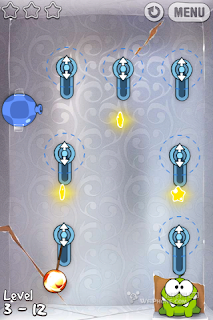 (4) "Cosmic Box" level 20: Shifted the locations of the left column of spikes and the rightmost lever. 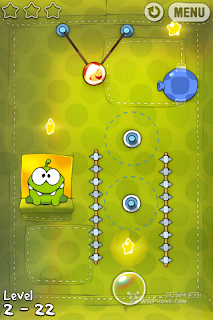 (5) "Cosmic Box" level 25: Removed the bottom row of spikes. 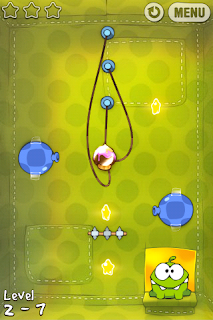 (1) "Fabric Box" Level 2-5 (modified in ver. 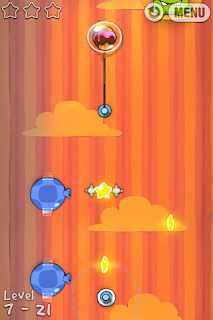 1.4): Changed the locations of the ropes and added a column of spikes at the bottom right. (2) "Fabric Box" Level 2-7 (modified in ver. 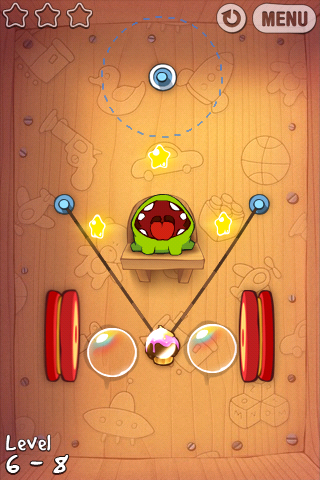 1.4): Changed the locations of the stars, air cushions and Om Nom. 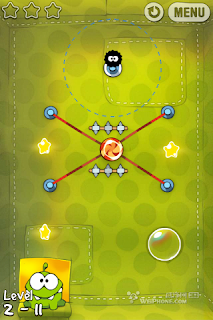 (3) "Fabric Box" Level 2-8 (modified in ver. 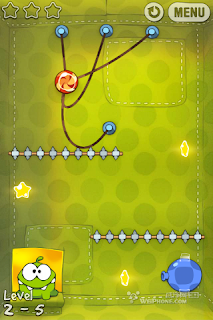 1.4): Changed the location of a star and added a hidden rope. (4) "Fabric Box" Level 2-10 (modified in ver. 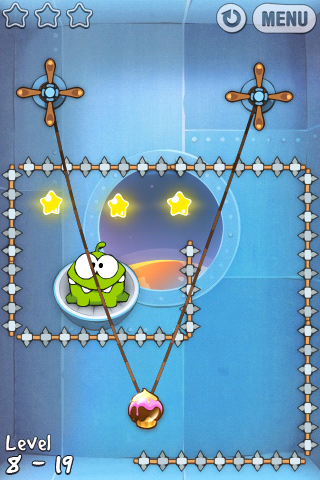 1.4): Changed the locations of the stars and Om Nom, and reduced from 4 hidden ropes to 3. (5) "Fabric Box" Level 2-11 (modified in ver. 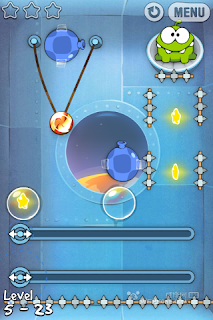 1.4): Changed the locations of the stars and devices. 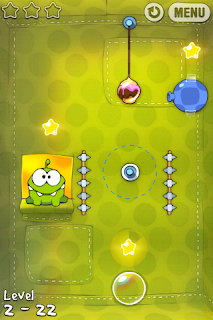 (6) "Fabric Box" Level 2-16 (modified in ver. 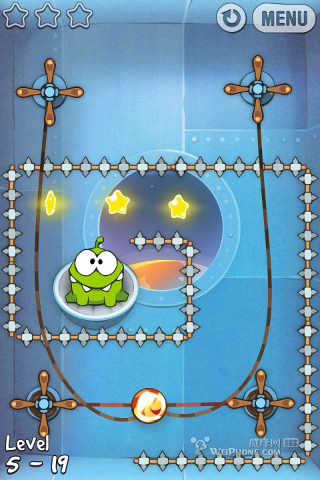 1.4): Changed the locations of the stars, bubble and Om Nom. (7) "Fabric Box" Level 2-22 (modified in ver. 1.4): Changed location of a star (top right one), reduced from 2 ropes to 1 and from 2 hidden ropes to 1. 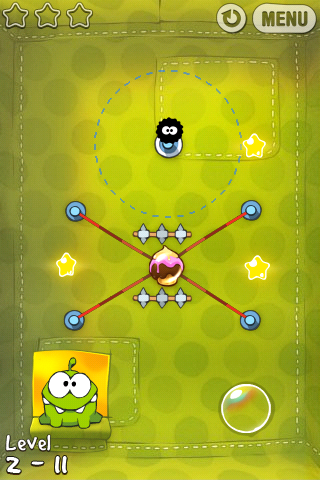 (8) "Foil Box" Level 3-12 (reported by "Gregor Fran", modified in ver. 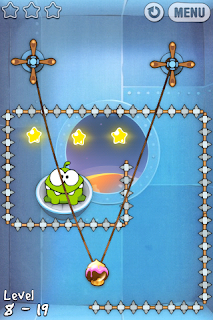 1.4 or 1.6): Removed 3 levers and changed the positions of the devices, stars and Om Nom. (9) "Foil Box" Level 3-13 (modified in ver. 1.4): Removed 1 row of spikes. (10) "Foil Box" Level 3-20 (modified in ver. 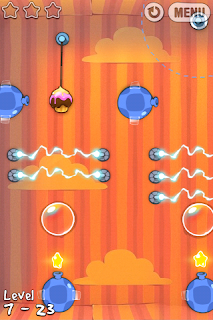 1.4): Removed 2 levers and 1 row of electric sparks. 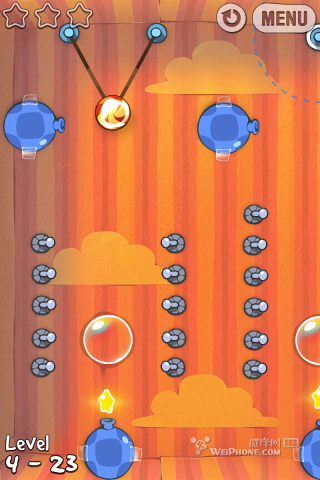 (11) "Foil Box" Level 3-24 (modified in ver. 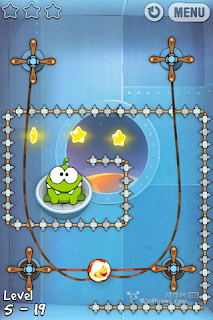 1.4): Added a hidden rope and shifted the positions of a star, Om Nom and bubble slightly. (12) "Magic Box" Level 4-11 (modified in ver. 1.6): BIG change to the level design ! The old design had an anti-gravity device which should be introduced in the "Cosmic Box" (previously the 5th box and now the 8th), so this level was probably changed because now the "Magic Box" has become the 4th box instead of the 7th in the old box order. 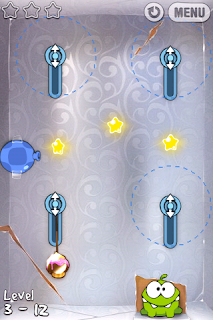 (13) "Valentine Box" Level 5-14 (modified in ver. 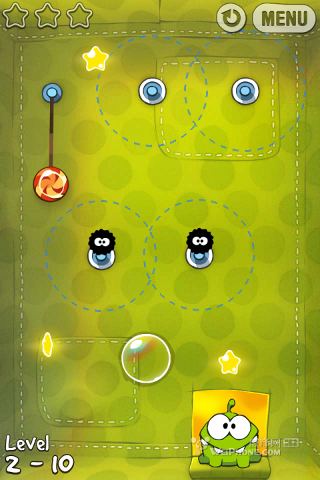 1.6): Removed 1 lever and shifted the starting positions of the levers and the left bubble. 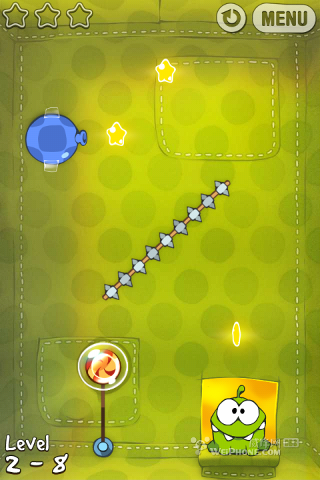 (14) "Toy Box" Level 6-8 (modified in ver. 1.6): The old design had an anti-gravity device which should be introduced in the "Cosmic Box" (previously the 5th box and now the 8th), so this level was probably changed because now the "Toy Box" has become the 6th box instead of the 8th in the old box order. 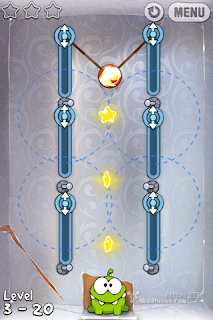 (15) "Gift Box" Level 7-6 (modified in ver. 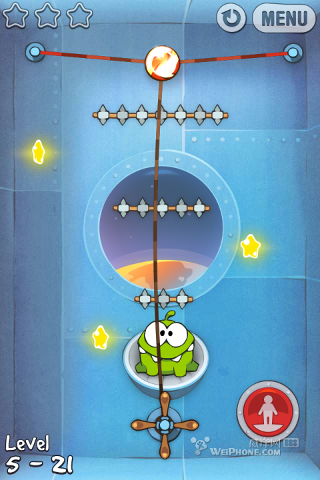 1.4): Small change to the rope at the bottom right. 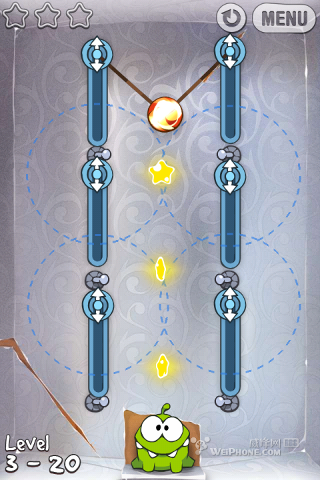 (16) "Gift Box" Level 7-21 (modified in ver. 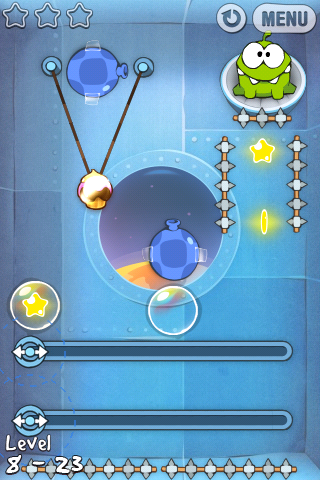 1.4): Changed the locations of the 3 stars. (17) "Gift Box" Level 7-23 (modified in ver. 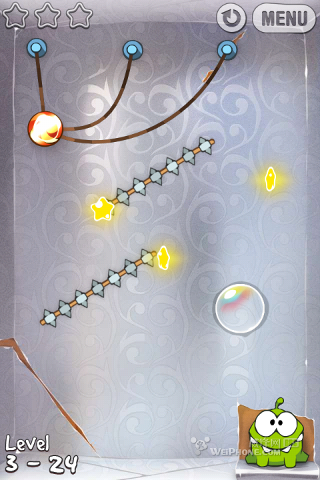 1.4): Reduced the number of rows of electric sparks from 5,6,7 rows to 2,3,4 rows (from left to right). (18) "Cosmic Box" Level 8-19 (modified in ver. 1.6): Removed 2 wheels, 2 ropes and 1 row of spikes, and tightened the 2 remaining ropes. 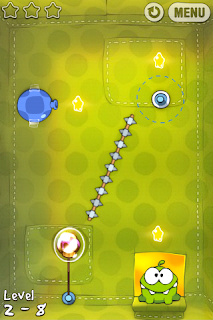 (19) "Cosmic Box" Level 8-21 (modified in ver. 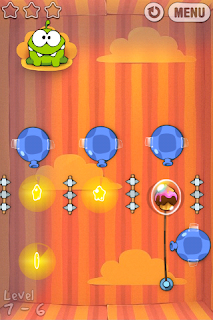 1.6): Removed 2 rows of spikes. (20) "Cosmic Box" Level 8-23 (modified in ver. 1.6): Some spikes have been removed and the positions of the 2 stars on the right have been changed slightly.